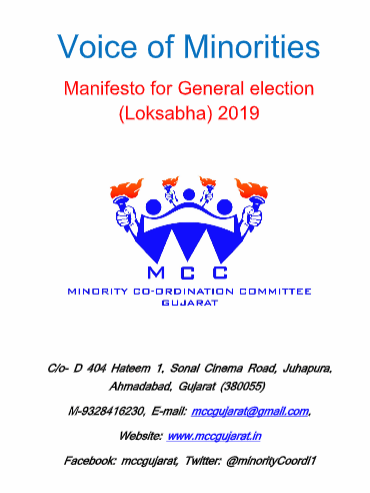 The Minority Coordination Committee (MCC), a Gujarat-based civil rights organization, has come up with a 14-point demands list for inclusion into political parties’ election manifestos for the 2019 polls. To be sent to political parties and their candidates shortly, these demands seek obligatory formation of minority commissions in every state and having a minority department in each state by promulgating law in Parliament. Seeking to drop Article 341 of the Constitution, which names specific religions (Hindu, Sikh, Buddhist) for providing reservation to scheduled castes, Nafees said, originally, when the Constitution was made, there was "no obligation" to be part of a particular religion for scheduled caste status. "This article was inserted by promulgating the Scheduled Castes and Scheduled Tribes Orders (Amendment) Act, 1956, which is discriminatory. There are Dalit Muslims and Dalit Christians, too, who are discriminated in the same way as other Dalits are, yet they are not being provided with the advantage of reservation", he said. 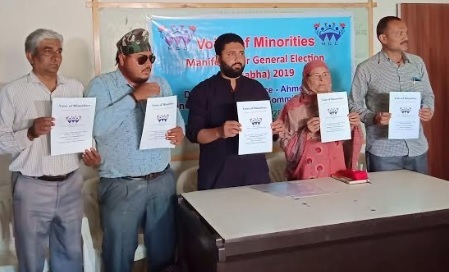 Claiming that minorities in Gujarat have “considerable influence” and can be “decisive” on eight to 10 seats of the Lok Sabha out of 26 in Gujarat, Nafees suggested there is a need for a “right kind of alliance with other oppressed sections, such as Dalits, who also have suffered under the BJP rule." Citing the example of Ahmedabad West (one of the two scheduled caste reserved seats), he added, the ruling party can be defeated here if minorities and Dalits come together. The National Commission of Minority Act 1992 is an ineffective legislation, which lacks distinguishable mechanism for the creation of a commission in different states. The powers of the commission are not clearly marked, due to which the effective and proper disposal of complaints of minority communities cannot be done in the country. There are state minority commissions in 18 states of the country. But there is no minority commission in Gujarat. Therefore, we demand that the National Minorities Commission Act 1992 should be amended, it should be given constitutional status and the formation of minority commission should be made mandatory for all the states. The Sachar Committee Report showed that the Muslim population of the country is behind the national average in employment (government, private), education and opportunities. This is due to rampant discrimination; they are being deprived of opportunities. Therefore, to meet the basic sense of the Constitution, "Equal Opportunities to All", an equal opportunities commission should be formed and constitutional powers be given to it so that all the minority communities of the country can get equal opportunities. The Sachar Committee Report shed light on the plight of the minority community and the kind of discrimination they are facing in the country. The minority affairs ministry should be made to work on matters of fundamental infrastructure, education, employment and security in minority populated areas. Due to lack of proper ministry in Gujarat, 11.5% of the population is deprived of opportunities; hence the formation of separate minority affairs department is required in all the states. The minority community of the country is lagging behind mainstream in all spheres. The reason behind this is lack of proper budgetary allocation by the government for the development of minority communities. In order to ensure population-wise budget allocation for the minorities in the entire country, there should be a special component plan for them. To prevent organized attacks on the minority community across the country, an urgent minority (prevention of atrocities) law should be made, and crimes against them should be made non-bailable. Religious compulsion should be removed from Article 341 (Scheduled Castes) of the Constitution. There was no obligation of religion for Scheduled Castes at the time of implementation of the Constitution, religion was inserted into it by the Scheduled Castes and Scheduled Tribes Orders (Amendment) Act, 1956. This article seeks to enhance religious discrimination, and it should be amended, so that the dream of justice can be extended to everyone. To prevent increasing communal violence in the country and to rehabilitate the people affected by it, to get timely justice and to remove fear from the hearts of the minority community, a communal violence prevention law should be enacted, in which special courts should be set up for early hearing of cases related to such violence. The country's minority society is far behind mainstream; to alleviate its plight the Prime Minister's new 15-point program should be expanded and implemented in all the districts of the country to enable the development of the backward and marginalized sections. There is a large number of police encounters allegedly reported across the country and there is a tendency to glorify them. It is a matter of concern as to why only people of minority community are targeted by the police. Therefore, a judicial inquiry commission should be formed on police encounter sin the country, which can bring out the truth. There is a growing trend of arms display in the country; some organizations are openly conducting arms training, demonstration, trident distribution etc., which should be stopped by the government with immediate effect because they are used to scare the minority community. Such arms training, and organizations performing them, should be banned. There are large numbers of Waqf properties across the country, which have illegally been encroached upon and sold. There should be a mechanism to save, promote and settle disputes quickly. Waqf tribunals should be made in each district of the state to work for the development of the community. The national and state Minority Finance and Development Corporations should be established, for which funds should be earmarked so that the minority community can get small loans and assistance from the corporation time to time. The minority community is a victim of political untouchability in the country. The Constitution of India states and believes in equal participation of all the deprived, weaker sections of the country. But we see that minority representation in politics is considerably less than that the proportion of the population. Therefore, to ensure political representation of deprived classes, laws should be made. There is a shortage of secondary and senior secondary schools in minority multi-pronged expansions, due to which children, especially girls, drop out of school after getting primary education, and their further education is affected. To ensure equal educational opportunities for all, higher secondary schools should be established in minority multi-pronged areas.